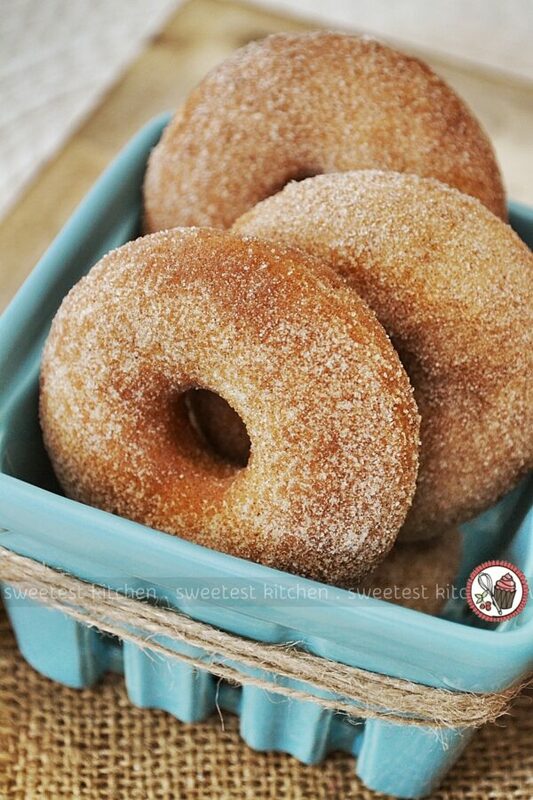 These baked cinnamon donuts are quick, easy and insanely delicious! Great to make with the kids, too! See, I got two mini donut baking pans from Williams Sonoma Australia and then I started making donuts. And then I didn’t stop. But that’s okay. Eventually I hit upon the best donuts ever. They’re quick, they’re easy, they’re fun to make and best of all, they are insanely delicious. And they’re absolutely gorgeous, too! Haven’t you got a donut pan yet? Maybe you’re a bit reluctant because you’re a traditionalist – donuts should be fried, not baked – and that’s okay. I was kind of that way, too. But baked donuts have became so popular lately, and they’re so appealing because there is no yeast involved, which means no waiting around for the dough to rise, so you can have a tasty little round pastry in your hand in a quarter of the time it would take to make yeast donuts. Or maybe you haven’t got a donut pan yet because you simply don’t want a donut that’s basically just a cake in the shape of a donut. And that’s okay, too. I was also kind of that way. But eventually I realized that I just don’t care. So what if I’m taking photos of a cake in the shape of a donut with icing and cute sprinkles. I want a donut pan, too. So yes, all the donuts I’ve made so far have basically just been scaled-down cake recipes. And that’s still okay. 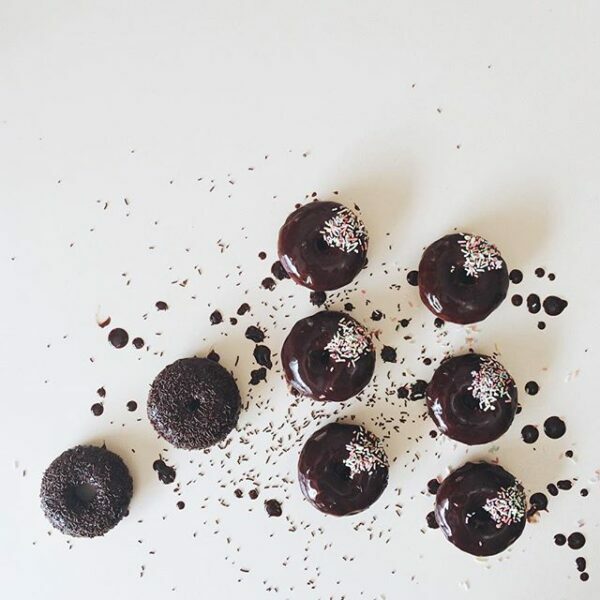 The mini donuts I’ve made so far have been so stinkin’ cute and all sorts of yummy. The kids have enjoyed helping to make them as well; they’re totally awed by the fact that they’ve just made donuts. 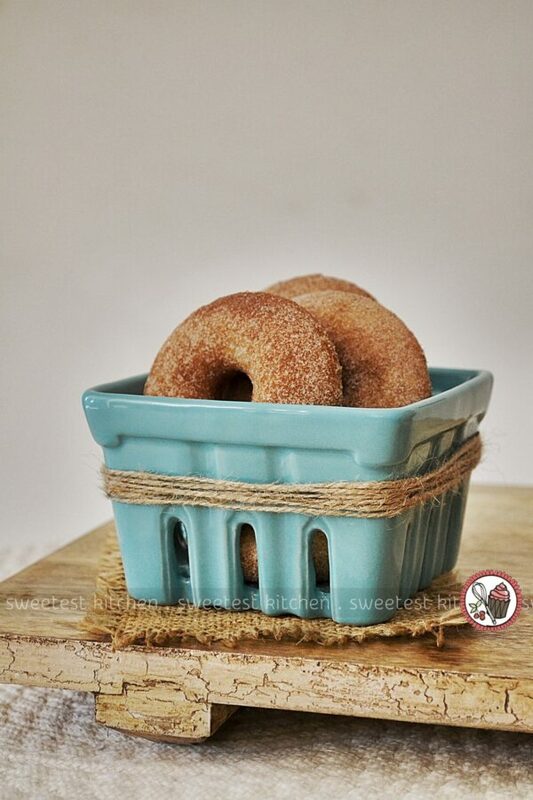 I found this recipe for baked cinnamon donuts at A Happy Food Dance while I was Pinterest-ing for donut recipes. Sure, I could have went with a bizarre-flavored donut, with funky-colored icing and loads of chunky stuff and flakey things piled on top. But this recipe looked irresistible. 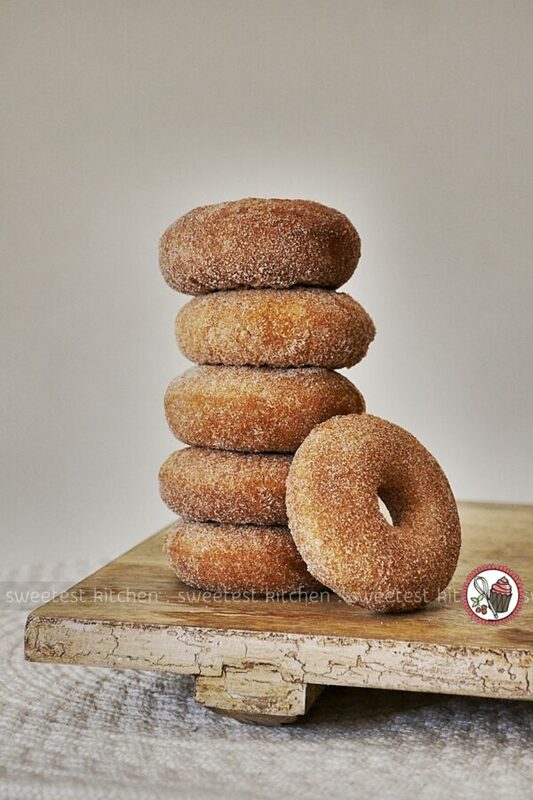 Just plain old donuts coated with cinnamon and sugar. Nothing fancy, just pure simplicity and deliciousness. Vanilla. I used vanilla bean paste instead of vanilla extract. I always use Beanilla vanilla bean paste, which is triple-fold so you need less of it. 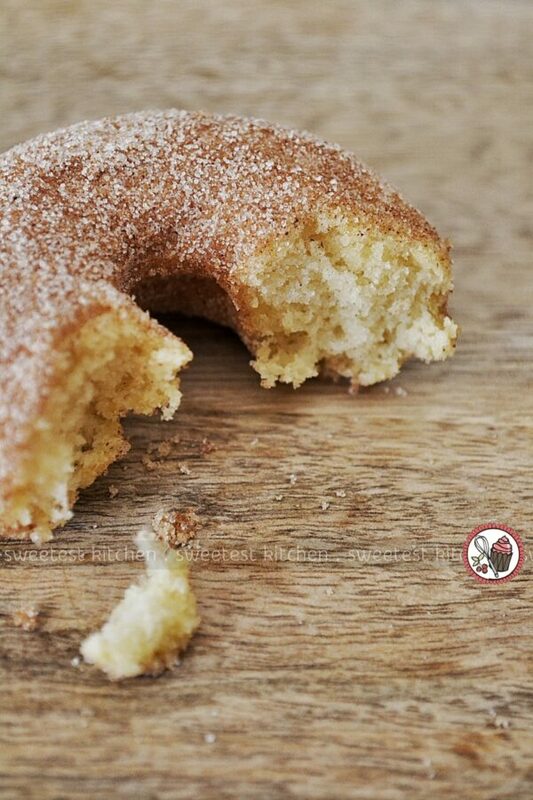 This gives the donuts a gorgeous hint of vanilla and it works so well with the cinnamon. Nutmeg. I added nutmeg to the batter. It just goes without saying that nutmeg and cinnamon go together, and the addition of nutmeg gives the donuts a lovely warm flavor. Vanilla, nutmeg and cinnamon. These three flavors combined really do make these donuts extra special. What’s your favorite donut flavor? —As a sort of side note, I’m sorry to all those that spell “donut” as “doughnut”. I couldn’t decide which way to spell it, so ended up going with what seems to be the most popular? How do you spell it?? Preheat oven to 180C (350F). Lightly grease two mini donut pans*. In a medium bowl, whisk together baking powder, salt nutmeg and flour. Set aside. In another bowl, whisk together egg, milk and vanilla. Set aside. In the bowl of a stand mixer, or using a hand mixer, cream together the butter and sugar until light and fluffy. Add the wet ingredients in two parts (mixture may look curdled), alternating with the dry ingredients. Mix last addition of dry ingredients just until combined; do not overmix. Spoon the batter into a piping bag or a large ziplock bag with a corner cut off. Pipe batter into the donut pan, filling each donut cavity ½ full. Bake for 10-12 minutes, or until donuts spring back when lightly touched. 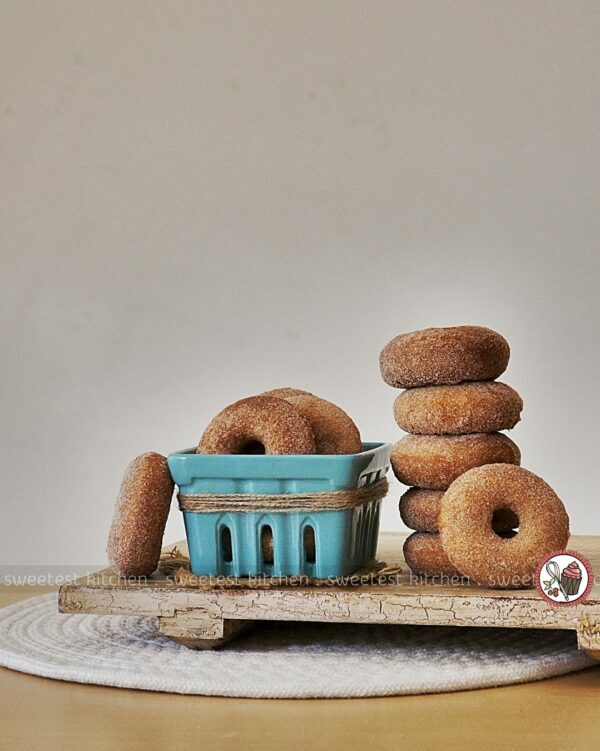 Tip the donuts out onto a wire rack. While the donuts are baking, melt the 113g butter for the coating. In another bowl mix the cinnamon and sugar together until completely combined. 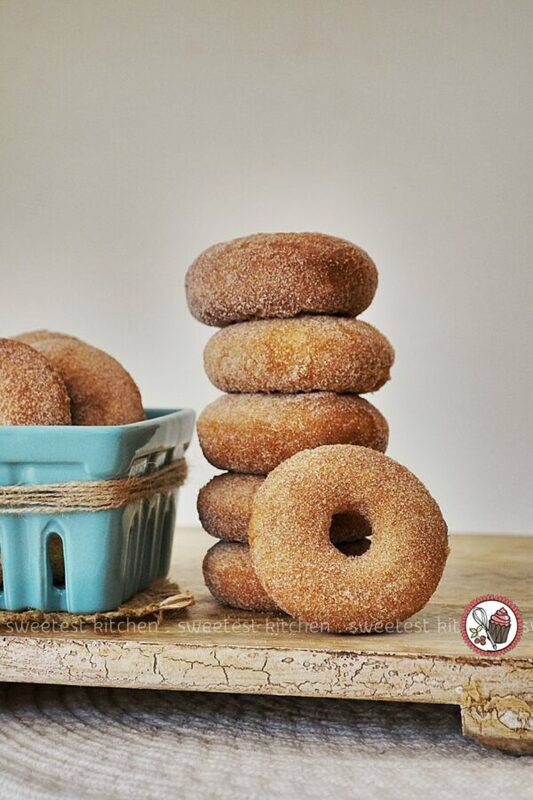 Pour the cinnamon-sugar mixture into a large ziploc or paper bag (you're going to shake the donuts in the mixture!). To coat the donuts, when they're just cool enough to handle, dip each donut quickly in the melted butter, gently shake off excess butter, then put the donut in the cinnamon-sugar bag. Seal the bag and gently shake, turn and invert the bag to completely coat the donut. When coated, open the bag, gently shake off excess and place on a gorgeous serving plate to enjoy! Store in an airtight container for a day or two, but best eaten within 24 hours. * I used Beanilla triple-fold Madagascan vanilla bean paste, so I only used around ⅓ teaspoon. If you have regular vanilla bean paste, use a full teaspoon. If you only have vanilla extract, feel free to use that instead. * This recipe can also make regular-sized donuts, just adjust the baking time for slightly longer - but keep your eye on the donuts so you don't overbake them. Don't have a donut pan? Use a mini muffin/cupcake pan! Did you like this recipe? If you enjoyed this recipe, please leave a comment, hit up one of those stars to rate it, and be sure to tag any photos with #sweetestkitchen on Instagram if you made this recipe! I'd love to see what you've created! These look great Jamieanne – love your adjustments and your photos are great! Beanilla posted this artlicle on Facebook today (9/2/15). 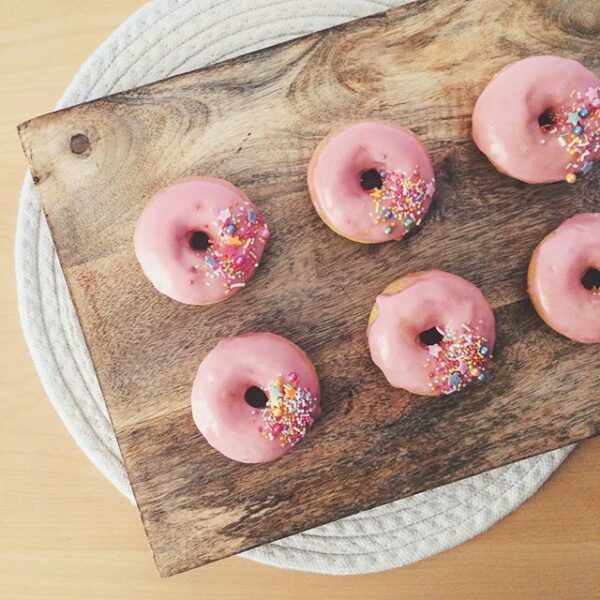 These are the prettiest little donuts I have ever seen. Like perfect, fluffy little pillows for the mouth. Gorgeous…just gorgeous. I am definitely going to try the recipe. Thank you! I made these and I love them! The texture was almost exactly that of cake donuts that you get at the store and they weren’t overly sweet like a lot of the cake donut recipes I’ve found online that would be better off as muffins. They are PERFECT and I will be serving them with coffee at this afternoon’s meeting. Thank you! Just curious if there’s a way to make them chocolate, while maintaining this perfect texture. One last thing. I replaced the milk with Vanilla Almond Milk and the butter with vegan butter, and it works just as well. So if you’re lactose intolerant like I am, this recipe does not need adjusting with the nondairy substitutes. Can you use Splenda instead. I’m not allowed to have sugar or any products that convert to yeast in the body. I miss donuts and wonder how Splenda would work? My wife is diabetic so I always use Splenda in place of sugar in baking and have never had a problem with it. 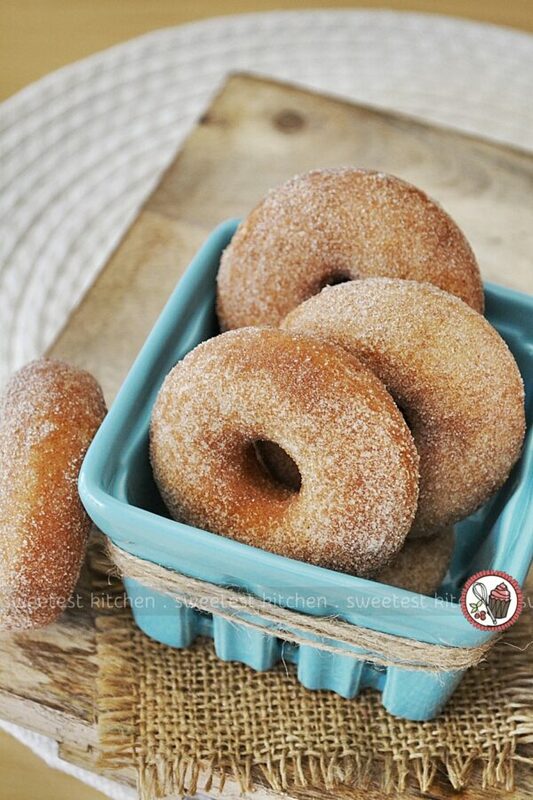 I haven’t tried making the baked donuts recipe yet ,but will in the next day or two and while I don’t expect a problem with the Splenda I will let you know if I have trouble with it. I’m curious if these would freeze well? I’d like to make them ahead of a party I’m throwing. Also, anyone make full-size donuts instead of the minis? What cook time did you adjust to? Hello! This one looks amazing, but I wanted some donuts to stuff with a custard or cream… Will these work, given that I’ll bake them in a muffin tin (no hole)? Any adjustments to make? Thanks! These look so good! Thank you so much for this recipe! My kids are going to love it!! I just made some while they were out at a party and I ate them! They were so good!! Not to sweet and that’s just how I like them! Love the photographs that make the donuts looks so inviting. 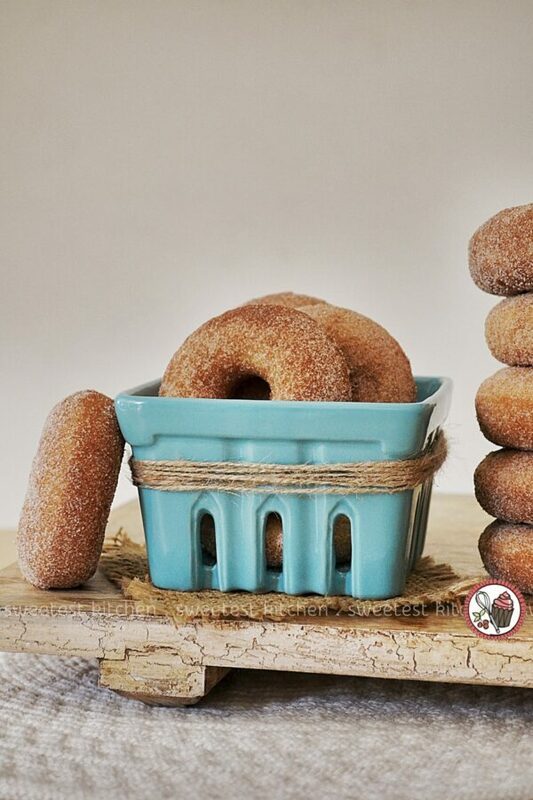 These donuts are a perfect companion for a cup of coffee! Is there any substitute of eggs? I am a vegetarian , please suggest what else can I use ? Otherwise it looks a delicious recipe and I want to try it. The donuts look amazing.. .. waiting to make it this weekend.. hope it turns out as lovely as yours. Me too! Let me know how they turn out!